Usage of Camel's integration components in Akka is essentially a one-liner. Here's an example. The above example exposes an actor over a TCP endpoint via Apache Camel's Mina component. The actor implements the endpointUri method to define an endpoint from which it can receive messages. After starting the actor, TCP clients can immediately send messages to and receive responses from that actor. If the message exchange should go over HTTP (via Camel's Jetty component), only the actor's endpointUri method must be changed. In the above example, any message sent to this actor will be sent to the JMS queue orders. Producer actors may choose from the same set of Camel components as Consumer actors do. The number of Camel components is constantly increasing. The akka-camel module can support these in a plug-and-play manner. Just add them to your application's classpath, define a component-specific endpoint URI and use it to exchange messages over the component-specific protocols or APIs. This is possible because Camel components bind protocol-specific message formats to a Camel-specific normalized message format. The normalized message format hides protocol-specific details from Akka and makes it therefore very easy to support a large number of protocols through a uniform Camel component interface. The akka-camel module further converts mutable Camel messages into immutable representations which are used by Consumer and Producer actors for pattern matching, transformation, serialization or storage. In the above example of the Orders Producer, the XML message is put in the body of a newly created Camel Message with an empty set of headers. You can also create a CamelMessage yourself with the appropriate body and headers as you see fit. The akka-camel module is implemented as an Akka Extension, the CamelExtension object. Extensions will only be loaded once per ActorSystem, which will be managed by Akka. The CamelExtension object provides access to the Camel trait. The Camel trait in turn provides access to two important Apache Camel objects, the CamelContext and the ProducerTemplate. Below you can see how you can get access to these Apache Camel objects. One CamelExtension is only loaded once for every one ActorSystem, which makes it safe to call the CamelExtension at any point in your code to get to the Apache Camel objects associated with it. There is one CamelContext and one ProducerTemplate for every one ActorSystem that uses a CamelExtension. Below an example on how to add the ActiveMQ component to the CamelContext, which is required when you would like to use the ActiveMQ component. 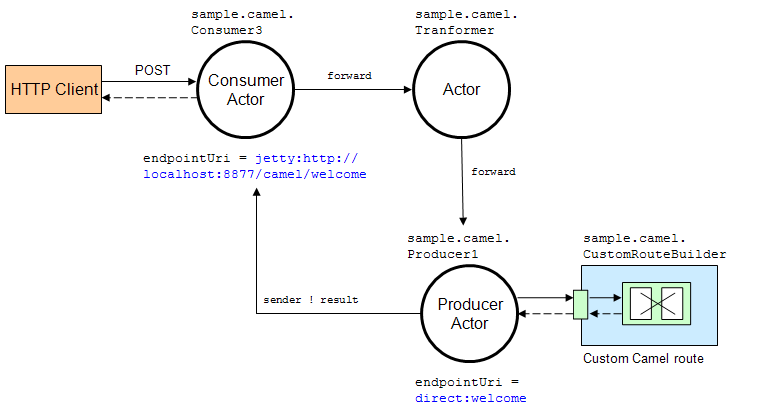 The CamelExtension is used by both Producer and Consumer actors to interact with Apache Camel internally. You can access the CamelExtension inside a Producer or a Consumer using the camel definition, or get straight at the CamelContext using the camelContext definition. Actors are created and started asynchronously. When a Consumer actor is created, the Consumer is published at its Camel endpoint (more precisely, the route is added to the CamelContext from the Endpoint to the actor). When a Producer actor is created, a SendProcessor and Endpoint are created so that the Producer can send messages to it. Publication is done asynchronously; setting up an endpoint may still be in progress after you have requested the actor to be created. Some Camel components can take a while to startup, and in some cases you might want to know when the endpoints are activated and ready to be used. The Camel trait allows you to find out when the endpoint is activated or deactivated. For objects to receive messages, they must mixin the Consumer trait. For example, the following actor class (Consumer1) implements the endpointUri method, which is declared in the Consumer trait, in order to receive messages from the file:data/input/actor Camel endpoint. Here's another example that sets the endpointUri to jetty:http://localhost:8877/camel/default. It causes Camel's Jetty component to start an embedded Jetty server, accepting HTTP connections from localhost on port 8877. After starting the actor, clients can send messages to that actor by POSTing to http://localhost:8877/camel/default. The actor sends a response by using the sender ! method. For returning a message body and headers to the HTTP client the response type should be CamelMessage. For any other response type, a new CamelMessage object is created by akka-camel with the actor response as message body. With in-only message exchanges, by default, an exchange is done when a message is added to the consumer actor's mailbox. Any failure or exception that occurs during processing of that message by the consumer actor cannot be reported back to the endpoint in this case. To allow consumer actors to positively or negatively acknowledge the receipt of a message from an in-only message exchange, they need to override the autoAck method to return false. In this case, consumer actors must reply either with a special akka.camel.Ack message (positive acknowledgement) or a akka.actor.Status.Failure (negative acknowledgement). Two-way communications between a Camel endpoint and an actor are initiated by sending the request message to the actor with the ask pattern and the actor replies to the endpoint when the response is ready. The ask request to the actor can timeout, which will result in the Exchange failing with a TimeoutException set on the failure of the Exchange. The timeout on the consumer actor can be overridden with the replyTimeout, as shown below. For sending messages to Camel endpoints, actors need to mixin the Producer trait and implement the endpointUri method. 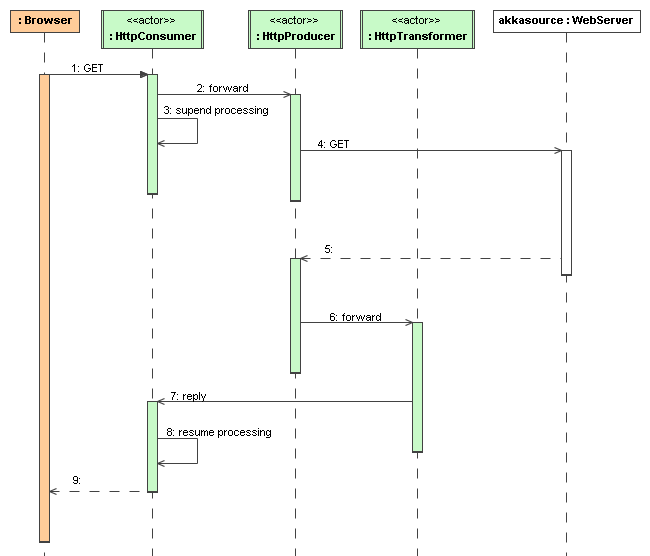 Producer1 inherits a default implementation of the receive method from the Producer trait. To customize a producer actor's default behavior you must override the Producer.transformResponse and Producer.transformOutgoingMessage methods. This is explained later in more detail. Producer Actors cannot override the default Producer.receive method. Any message sent to a Producer actor will be sent to the associated Camel endpoint, in the above example to http://localhost:8080/news. The Producer always sends messages asynchronously. Response messages (if supported by the configured endpoint) will, by default, be returned to the original sender. The following example uses the ask pattern to send a message to a Producer actor and waits for a response. Instead of replying to the initial sender, producer actors can implement custom response processing by overriding the routeResponse method. In the following example, the response message is forwarded to a target actor instead of being replied to the original sender. Before producing messages to endpoints, producer actors can pre-process them by overriding the Producer.transformOutgoingMessage method. The interaction of producer actors with Camel endpoints can be configured to be one-way or two-way (by initiating in-only or in-out message exchanges, respectively). By default, the producer initiates an in-out message exchange with the endpoint. For initiating an in-only exchange, producer actors have to override the oneway method to return true. The Producer trait is a very convenient way for actors to produce messages to Camel endpoints. Actors may also use a Camel ProducerTemplate for producing messages to endpoints. For initiating a a two-way message exchange, one of the ProducerTemplate.request* methods must be used. A consumer endpoint sends request messages to its consumer actor using the ! (tell) operator and the actor returns responses with sender ! once they are ready. A producer actor sends request messages to its endpoint using Camel's asynchronous routing engine. Asynchronous responses are wrapped and added to the producer actor's mailbox for later processing. By default, response messages are returned to the initial sender but this can be overridden by Producer implementations (see also description of the routeResponse method in Custom Processing). However, asynchronous two-way message exchanges, without allocating a thread for the full duration of exchange, cannot be generically supported by Camel's asynchronous routing engine alone. This must be supported by the individual Camel components (from which endpoints are created) as well. They must be able to suspend any work started for request processing (thereby freeing threads to do other work) and resume processing when the response is ready. This is currently the case for a subset of components such as the Jetty component. All other Camel components can still be used, of course, but they will cause allocation of a thread for the duration of an in-out message exchange. There's also a Asynchronous routing and transformation example that implements both, an asynchronous consumer and an asynchronous producer, with the jetty component. To access actors from custom Camel routes, the actor Camel component should be used. It fully supports Camel's asynchronous routing engine. If set to true, in-only message exchanges are auto-acknowledged when the message is added to the actor's mailbox. If set to false, actors must acknowledge the receipt of the message. In the following example, a custom route to an actor is created, using the actor's path. the akka camel package contains an implicit toActorRouteDefinition that allows for a route to reference an ActorRef directly as shown in the below example, The route starts from a Jetty endpoint and ends at the target actor. When a message is received on the jetty endpoint, it is routed to the Responder actor, which in return replies back to the client of the HTTP request. The previous section, Akka Camel components, explained how to setup a route to an actor manually. It was the application's responsibility to define the route and add it to the current CamelContext. This section explains a more convenient way to define custom routes: akka-camel is still setting up the routes to consumer actors (and adds these routes to the current CamelContext) but applications can define extensions to these routes. Extensions can be defined with Camel's Java DSL or Scala DSL. For example, an extension could be a custom error handler that redelivers messages from an endpoint to an actor's bounded mailbox when the mailbox was full. This example demonstrates how to implement consumer and producer actors that support Asynchronous routing with their Camel endpoints. The sample application transforms the content of the Akka homepage, https://akka.io, by replacing every occurrence of Akka with AKKA. To run this example, add a Boot class that starts the actors. After starting the Microkernel, direct the browser to http://localhost:8875 and the transformed Akka homepage should be displayed. Please note that this example will probably not work if you're behind an HTTP proxy. The following figure gives an overview how the example actors interact with external systems and with each other. A browser sends a GET request to http://localhost:8875 which is the published endpoint of the HttpConsumer actor. The HttpConsumer actor forwards the requests to the HttpProducer actor which retrieves the Akka homepage from https://akka.io. The retrieved HTML is then forwarded to the HttpTransformer actor which replaces all occurrences of Akka with AKKA. The transformation result is sent back the HttpConsumer which finally returns it to the browser. Implementing the example actor classes and wiring them together is rather easy as shown in the following snippet. // to your boot class. The jetty endpoints of HttpConsumer and HttpProducer support asynchronous in-out message exchanges and do not allocate threads for the full duration of the exchange. This is achieved by using Jetty continuations on the consumer-side and by using Jetty's asynchronous HTTP client on the producer side. The following high-level sequence diagram illustrates that. This section also demonstrates the combined usage of a Producer and a Consumer actor as well as the inclusion of a custom Camel route. The following figure gives an overview. The consumer, transformer and producer actor implementations are as follows. The producer actor knows where to reply the message to because the consumer and transformer actors have forwarded the original sender reference as well. The application configuration and the route starting from direct:welcome are done in the code above. To run the example, add the lines shown in the example to a Boot class and the start the Microkernel and POST a message to http://localhost:8877/camel/welcome. Here is an example showing how simple is to implement a cron-style scheduler by using the Camel Quartz component in Akka. For an introduction to akka-camel 2, see also the Peter Gabryanczyk's talk Migrating akka-camel module to Akka 2.x.